In the wake of family collapse, a writer moves to London with her two young sons. The process of upheaval is the catalyst for a number of transitions—personal, moral, artistic, practical—as she endeavors to construct a new reality for herself and her children. In the city she is made to confront aspects of living she has, until now, avoided, and to consider questions of vulnerability and power, death and renewal, in what becomes her struggle to reattach herself to, and believe in, life. 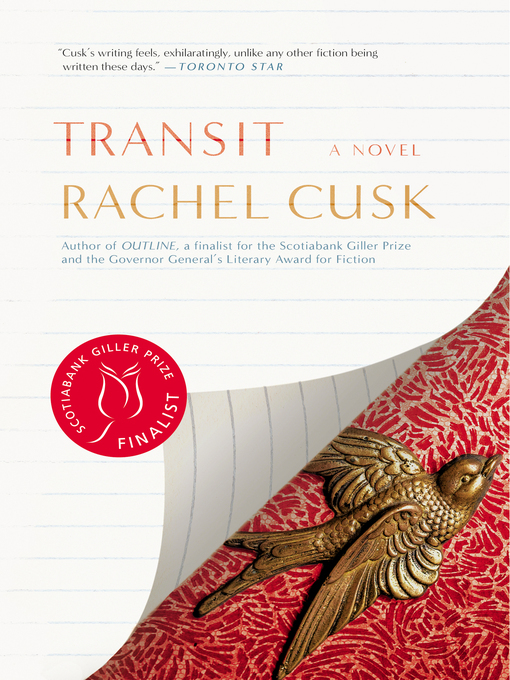 Filtered through the impersonal gaze of its keenly intelligent protagonist, Transit sees Rachel Cusk delve deeper into the themes first raised in her critically acclaimed novel Outline, and offers up a penetrating and moving reflection on childhood and fate, the value of suffering, the moral problems of personal responsibility, and the mystery of change. In this precise, short, and yet epic novel, Cusk manages to describe the most elemental experiences, the liminal qualities of life, through a narrative near-silence that draws language toward it. She captures with unsettling restraint and honesty the longing to both inhabit and flee one's life and the wrenching ambivalence animating our desire to feel real.